Save the date! This year the World’s Largest Golf Outing (WLGO) will be held on Monday, May 1. The single largest charitable golf event held on a single day, WLGO makes a significant impact in the lives of those who need it most – our nation’s veterans – and communities across the country. This year, for the first time in its history, WLGO will benefit two sponsors: Fisher House Foundation and Arnie’s Army. Fisher House Foundation is best known for a network of comfort homes where military and veterans’ families can stay at no cost while a loved one is receiving treatment. 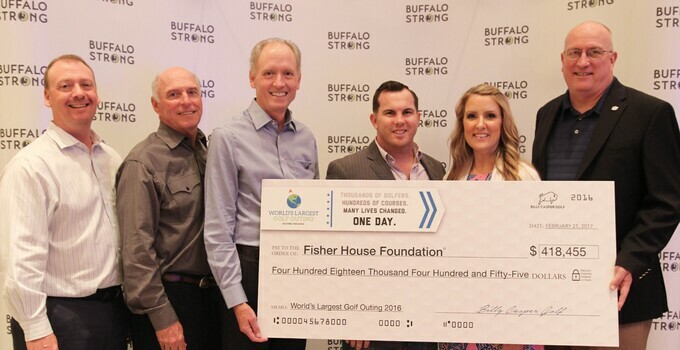 At the recent Buffalo Strong Celebration in Orlando, Major Robert Kilmartin, a two-time Purple Heart recipient, spoke on behalf of Fisher House about the profound impact golf has had on his life. Arnie’s Army, this year’s other WLGO sponsor, is an Arnold Palmer-inspired charity that provides financial support to institutions and organizations that help children, youth, families, the environment and the communities in which we live. For more information, or to register for this year’s event, click here.